The survey listed landowners alphabetically by the initial letter of their surname, with the lands then arranged by occupants. This order has been retained in the transcript but, in addition, a list in numerical order gives just the owner and folio number for each entry. An alphabetical index of landowners and occupiers, including folio numbers, has also been provided. The original schedule lists the individual acreages of arable, meadow, pasture, wood and sundries in separate columns, but to save space these have been combined, and an additional column has been inserted to show land use. The centre pages reproduce sections of the 1846 Mitcham tithe map, which used the same plot numbers. The whole parish is covered by four double-page maps, at a scale much reduced from the original and with plot numbers retyped at a readable size. An even more reduced copy of the complete map is reproduced as the centrefold. Three single-page copies of this map have been shaded and outlined to show the major landowners, the main occupiers, and the use to which the land was put in 1838, and these appear at the end of the booklet. has a rectangular red leather label, gilt-tooled and gilt-lettered: PARISH OF MITCHAM COLLECTED REFERENCE. SURVEYED by Messrs Crawter & Smith 1838.
mostly blank, though some have short notes in red ink. on Mitcham Common closed in 1838. Mode of Surveying the Parish be adjourn’d untill [sic] Thursday Evening at Seven o’Clock (precisley)” [sic]. called the New Parochial Assessment Act “An Act to regulate Parochial Assessments”, at a sum not exceeding £420. 0.
and also the expence of one or more labourers or Boys to attend upon and assist the said Surveyors. communication of any information or particulars relative thereto that they may think proper to make to the Overseers. detaild account provided £36 12s 6d. their giving the detailed valuation required. Messrs Crawter & Smith, which was objected to by Mr Makepeace carried by a majority of seven. thereto at One Shilling and Sixpence in the Pound Rent”. 1 April 1839 By Cash – paid to labourers for assisting in the Survey of the Parish pr order of Vestry £36 12s 6d. valuation of the Parish as pr order of the Board of Guardians £20. occupiers of these lands were not listed in 1846, but were listed in 1838. Immediately after the main schedule of the 1838 survey is a section headed: Abstract to the Foregoing Reference. omitted from this transcript for lack of space, but it proved invaluable in confirming the accuracy of the transcript. the reason for this is not obvious. transcript by the use of italics. The abstract also has a few further additions, here shown in square brackets [ ]. identifying the name or location of each property, have not been transcribed. combined, and an additional column has been inserted to show land use. 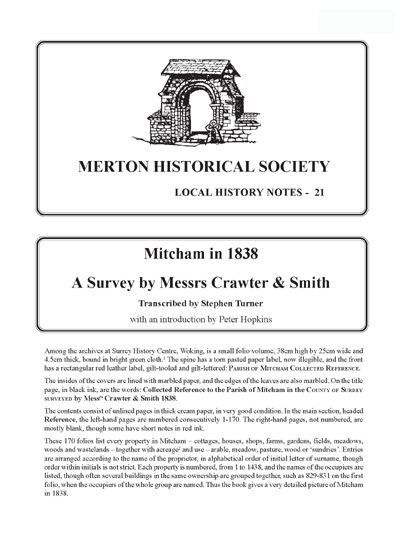 The centre pages reproduce sections of the Mitcham tithe map, by kind permission of Surrey History Service. the main occupiers, and the use to which the land was put in 1838, and these appear at the end of the booklet. medium-scale maps of the East and West Fields, showing the survival of the medieval open-field system. 2. 1 acre = 4 roods. 1 rood = 40 square perches. 1 acre = 0.405 hectares. 3. Surrey History Centre 6781/1/5, pages 266-289. Hereafter Poor, is shortly to be published by Merton Historical Society as the third in its Studies in Merton History series. sundries	19	943	BRIDGES Esq. sundries	1	4	1432	BRIDGES Esq. sundries	2	25	1303	SPENCER	129	Revd. 8	1	39	715	WATNEY, John	156	William Thos. 397	WOODYER, Charles	158	Wm.